UNITED NATIONS — Secretary-General Ban Ki-moon is working on a package that would provide "material assistance" to cholera victims in Haiti, his spokesman said Friday, strongly indicating for the first time that hundreds of thousands of people affected will get financial help from the United Nations. The statement from deputy spokesman Farhan Haq follows Thursday's statement in which the U.N. said for the first time that it was involved in the introduction of cholera to Haiti and needs to do "much more" to end the suffering of those who contracted the disease, estimated at more than 800,000 people. Haq said Friday that the secretary-general "deeply regrets the suffering" that cholera has caused and "the United Nations has a moral responsibility to the victims." Researchers say cholera was first detected in Haiti's central Artibonite Valley and cite evidence that it was introduced to the country's biggest river from a U.N. base where Nepalese troops were deployed as part of a peacekeeping operation which has been in the country since 2004. Cholera is endemic in Nepal. The United Nations has never accepted responsibility and has answered lawsuits on behalf of victims in U.S. courts by claiming diplomatic immunity. Haq's statement Thursday came a step closer to an admission of at least some responsibility and was welcomed by lawyers for the victims. Haq told reporters Friday that the secretary-general took note of the decision late Thursday by a U.S. federal appeals panel in New York upholding immunity for the U.N. and affirming a lower court's 2015 judgment dismissing claims by cholera victims for reparations. The victims and their lawyers have 90 days to decide if they will seek an appeal with the U.S. Supreme Court. "The secretary-general deeply regrets the terrible suffering the people of Haiti have endured as a result of the cholera epidemic," Haq said. "The United Nations has a moral responsibility to the victims of the cholera epidemic and for supporting Haiti in overcoming the epidemic and building sound water, sanitation and health systems." He said the package that the secretary-general is developing "would provide material assistance and support to those Haitians most directly affected by cholera ... (and) must include, as a central focus, the victims of the disease and their families." He said details of the package are still under discussion. Haiti is the poorest country in the Western hemisphere and only 24 percent of Haitians have access to a toilet. Sewage is rarely treated and safe water remains inaccessible to many. Haq said "the United Nations also intends to intensify its support to reduce, and ultimately end, the transmission of cholera, improve access to care and treatment and address the longer-term issues of water, sanitation and health systems in Haiti." Despite repeated appeals, he said, U.N. efforts to tackle cholera have been seriously underfunded. The secretary-general is urging all member states to show solidarity with the people of Haiti and increase their contributions to eliminate cholera and help those affected, Haq said. According to government figures, cholera has sickened more than 800,000 people, or about 7 percent of Haiti's population, and has killed more than 9,200 since the outbreak began in October 2010. As of March, it was killing an average of 37 people a month. Haq said international and national efforts have led to a 90 percent reduction in the number of cases since the peak in 2011. But he said cholera won't be eliminated without stepped up efforts from the Haitian government and international community "and crucially, the resources to fulfill our shared duty." 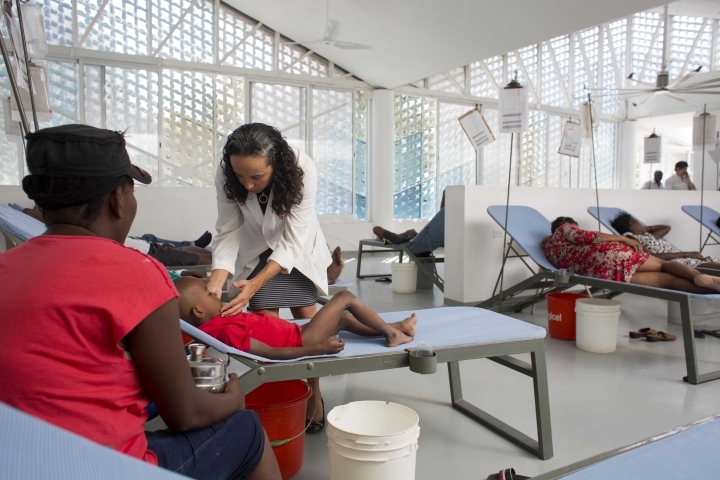 In December 2012, U.N. Secretary-General Ban Ki-moon announced a $2.27 billion initiative to help eradicate cholera in Haiti and the neighboring Dominican Republic, which share the island of Hispaniola. But according to a report last November the ambitious 10-year plan had only received $307 million. Associated Press writer David McFadden in Port-au-Prince, Haiti, contributed to this report.